Digital Genome Market Size « Global Market Insights, Inc. The prominent applications of digital genome industry are microbiology, reproductive & genetic, research & development, transportation, and livestock & agriculture sectors. Microbiology application segment accounted for more than 22% of the revenue share in 2015 and will surpass a revenue collection of USD 10 billion by 2024. The growing demand for microbes across clinical, biological, and industrial sectors should drive the revenue. Research & development dominated the application landscape in 2015 and will contribute a revenue of more than USD 23 billion by 2024. The growth can be attributed to heavy investments by private and public sector firms in research activities. Sequencing and analysis software, one of the product bifurcations of digital genome market, will register an annual growth rate of 9.8% over the period of 2016 to 2024, owing to the increasing efforts to upgrade software packages. High investments in life science research will favor sequencing and analyzer instrument industry, which covered more than 40% of the global digital genome market contribution in 2015. Sample prep instruments, sequencing chip, and RNA or DNA analysis kits are the other notable products in digital genome industry. China digital genome market size will grow at an annual growth rate of more than 10% over the period of 2016 to 2024. The growth can be attributed to the supportive governmental activities in the favor of human genetic development. Moreover, the strategic partnerships between the biobanks and research institutes will influence the industry share noticeably. U.S. digital genome market covered over 80% of the North America regional share in 2015 and will generate significant revenue over the coming seven years, owing to the genome sequencing technological enhancements along with availability of advanced healthcare infrastructure. Brazil digital genome market is anticipated to record a considerable growth rate over the coming timeframe. The supportive rules and regulations regarding genetic and clinical testing will augment the business growth. 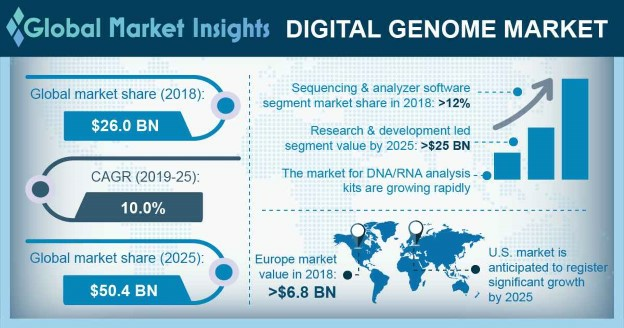 Russia digital genome market collected a revenue of around USD 290 million in 2015 and will exhibit lucrative growth over the coming years of 2016 to 2024, primarily driven by the fierce competition prevalent in the region. The Genome Russia project launched by St. Petersburg State University in Russia, aims to collect and scrutinize genome sequences from different regions across the country, which is also expected to generate a noticeable revenue over the coming seven years. Collaborations, acquisitions, and novel product innovations are the business growth strategies of industry giants. The corporations operating in digital genome market are Becton Dickinson, Agilent Technologies, Qiagen, Thermo Fisher Scientific, Illumina, Pacific Biosciences, Perkin Elmer, Sigma-Aldrich, BioMarin Pharmaceutical, Fluidigm Corporation, Bio-Reference Laboratories, AVEO Oncology, and Agios. This entry was posted in Healthcare & Medical Devices and tagged Agriculture, Analysis Software, Analyzer Instruments, Biological, Clinical, Digital Genome Market, Digital Genome Market Research Report, Digital Genome Market Size, DNA/RNA Analysis Kits, Forensics, Genetic, Industrial, Livestock, Microbiology, R&D, Reproductive, Sample Prep Instruments, Sequencing Chips, Sequencing Instruments, Sequencing Software, Transplantation.